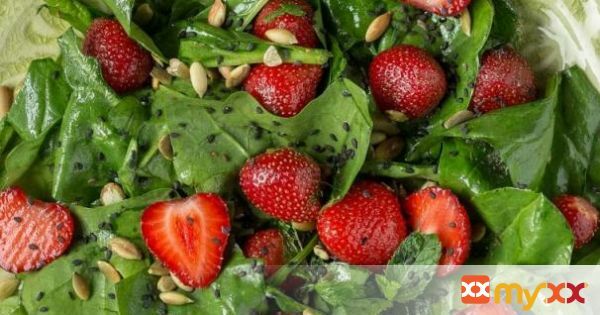 This easy, symbol of summer is delicious with bright red strawberries, juicy green spinach, and a homemade vinaigrette. 1. Mix the ingredients for dressing: vinegar, honey and sugar, mustard, salt and pepper. 2. Mix everything thoroughly with olive oil. 3. Wash the spinach and wipe with a kitchen towel. 4. Remove the strawberry stems. Leave the small berries whole, the big ones – cut in half. 5. Mix the berries with spinach and add 2 tbs of dressing. Mix it and taste. If necessary, add more dressing. 6. Sprinkle with chia and pumpkin seeds and serve. 7. P.S. a cup measurement is given for reference only. Take a measure (a glass, coffee spoon, table spoon) and try it, finding your most suitable option.